Recent estimates of species richness in the Congo basin vary but converge on a number close to 1270. However, that diversity is not evenly partitioned and the lower Congo River (LCR) is highlighted as a hotspot of species richness and endemism within the basin. In marked contrast to the river upstream of Pool Malebo, the LCR channel is entirely bedrock, and littoral habitats are mostly rocky and rock strewn. In situ measurements have recorded dramatic changes in channel topology and in addition to fluctuating bed bathymetry, regions of extreme depth have also been recorded. A combination of high annual discharge, steep elevational incline, and fluctuating channel width and depth result in high-energy flow regimes throughout the system. These hydrological features appear to play a key role in isolating fish populations by restricting both cross-channel and upstream-downstream movement, and likely present powerful drivers for micro-allopatric isolation often over remarkably small geographical scales. 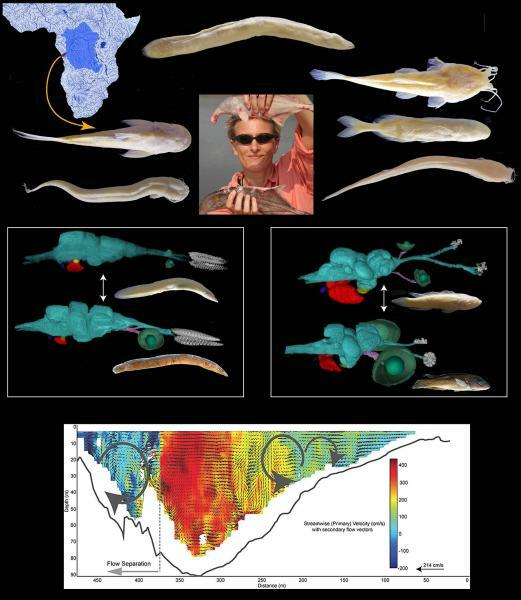 Among the many species endemic to the LCR are a group of distantly related fishes exhibiting a striking series of multi-trait morphological convergence (including microphthalmia or eye loss, depigmentation, laterosensory enhancement etc.). These “cryptophthalmic” forms have arisen independently in at least six phylogenetically disparate families (Cichlidae, Mastacembelidae, Mochokidae, Claroteidae, Clariidae, Mormyridae), likely in response to similar selective pressures within the extreme environments of the LCR. Here I will present results of an ongoing investigation to characterize and quantify of this case of extreme eco-morphological convergence.